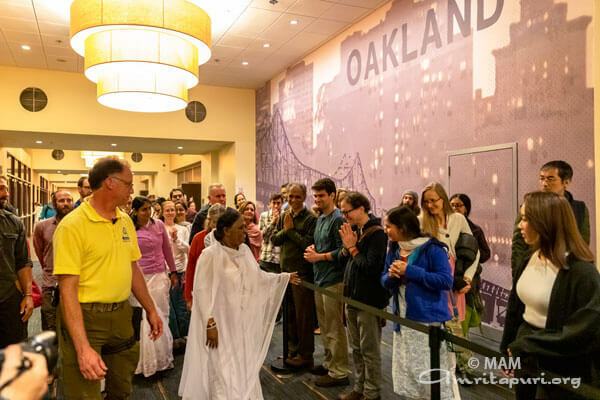 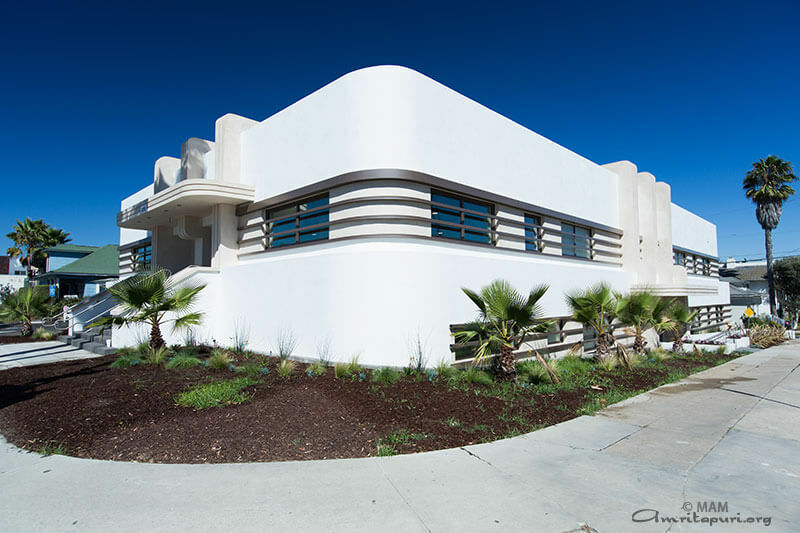 In 1987, when Amma first visited the United States, devotees gathered in houses and small churches in Oakland, California. 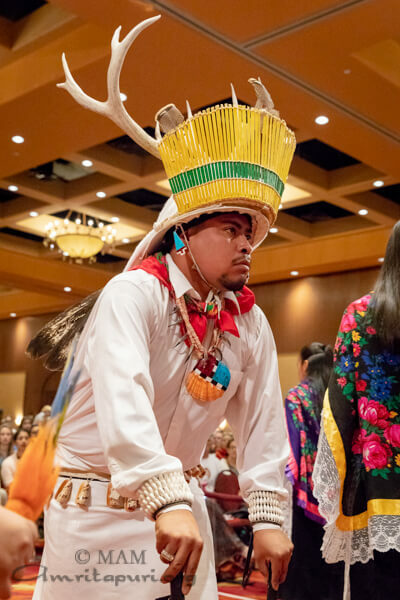 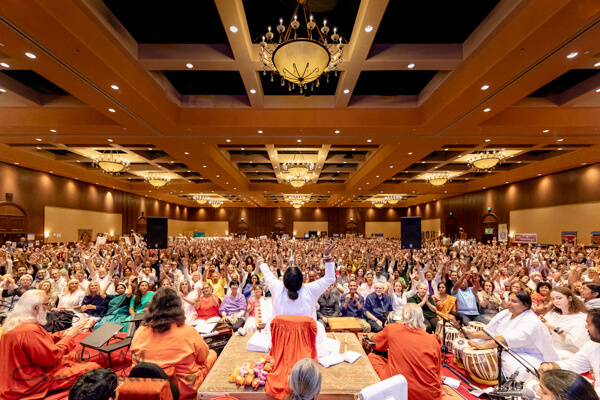 Thirty-one years later, Amma’s fall programs in the Bay Area were held in Oakland again – this time at the City Center Marriott, one of the Bay Area’s largest convention centers. 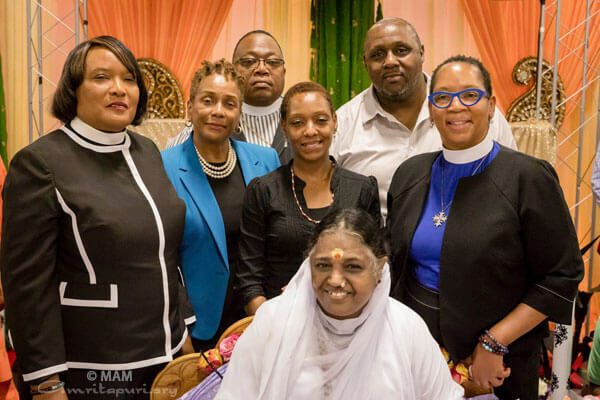 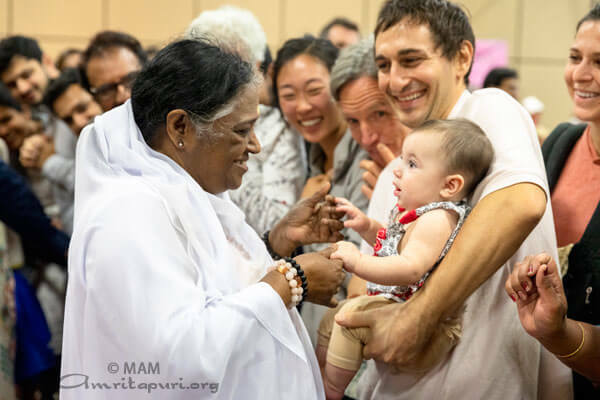 In the two weeks prior to Amma’s visit, parts of northern and southern California had been hit by devastating fires. 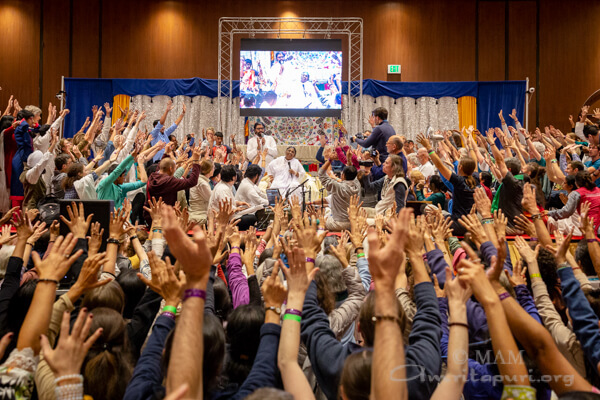 The ‘Camp Fire’, situated approximately 200 miles north of Oakland was the most destructive in California history. 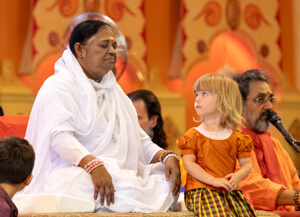 Over 80 people perished and more than 18,000 structures were destroyed. 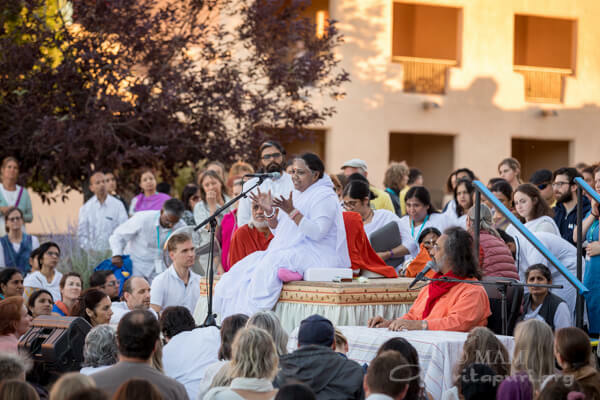 The entire Bay Area had been enveloped in a cover of smoke reaching unhealthy levels not seen before in the region. 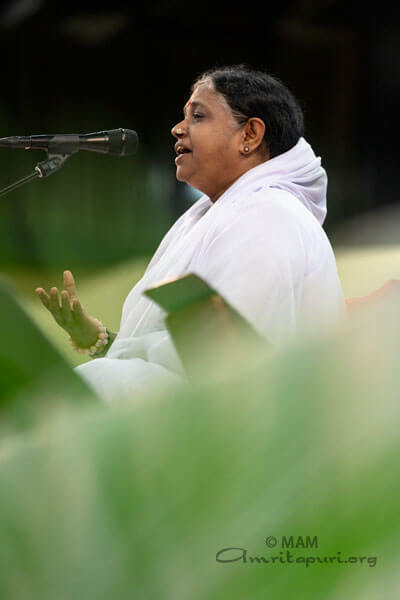 While the rainy season generally starts in mid-October, the area had yet to receive any significant rain. 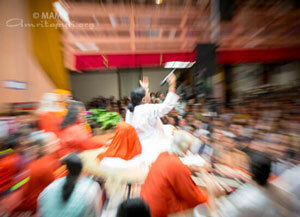 Miraculously, on the evening of Amma arrival, the first storm of the season descended on the area and brought cleansing rains. 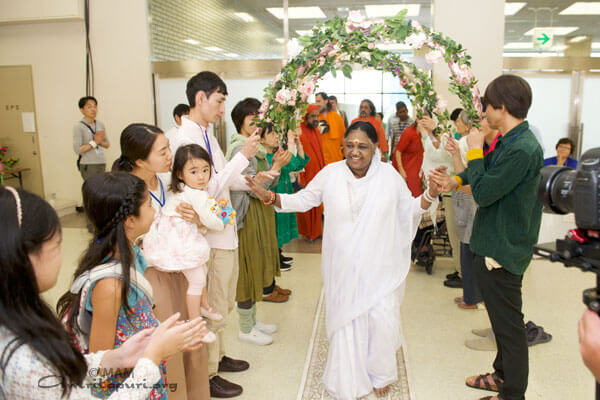 As Amma entered the hall on the first morning, she was greeted by local children who lined the walkway to the hallway holding votive candles. 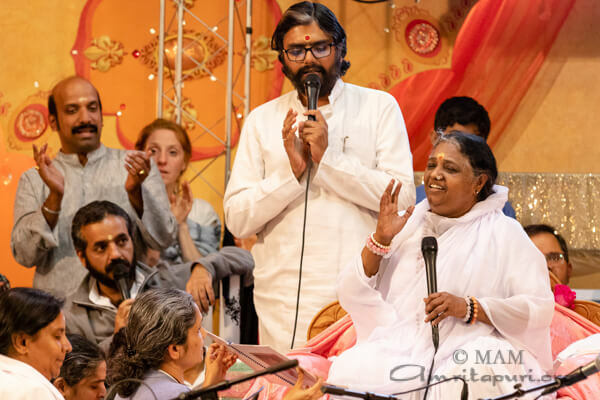 During the first program, Consul General of India – San Francisco, Mr. Sanjay Panda, garlanded Amma and spoke briefly, “I would like to welcome Amma to the Bay area on behalf of all of you. 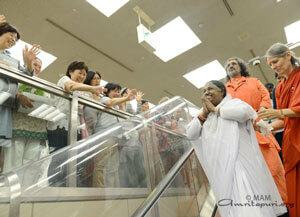 This love and compassion that Amma spreads is a message of love from India. 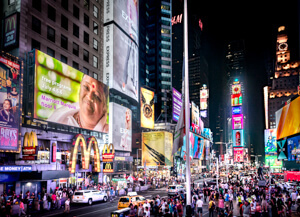 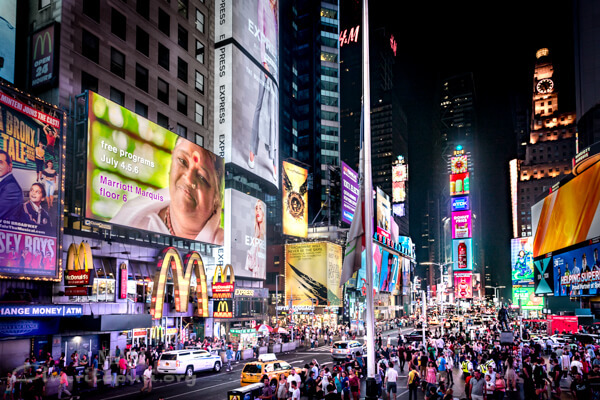 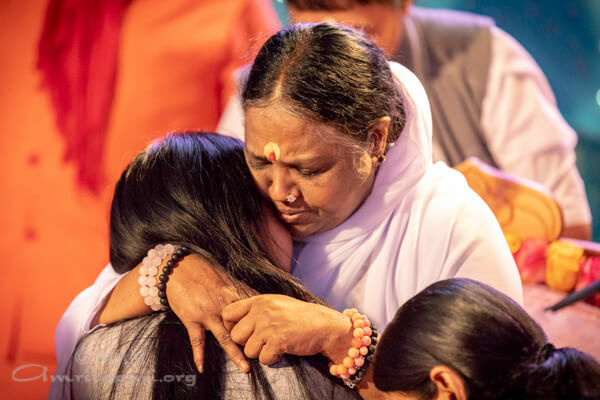 It is a message to the world, and that magical embrace that all of us have come to know is something that guides us in our path as we move forward. 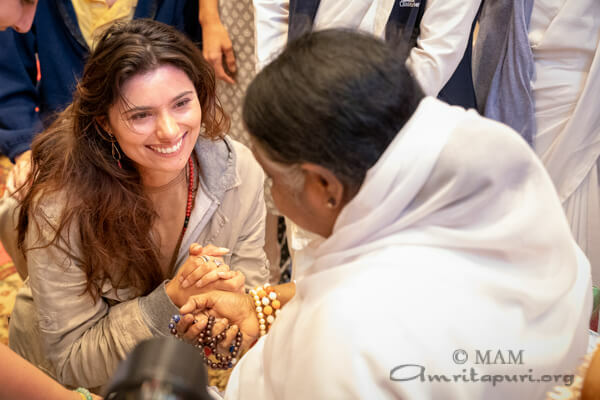 I welcome Her, and I seek, on behalf of all of you, her Blessings. 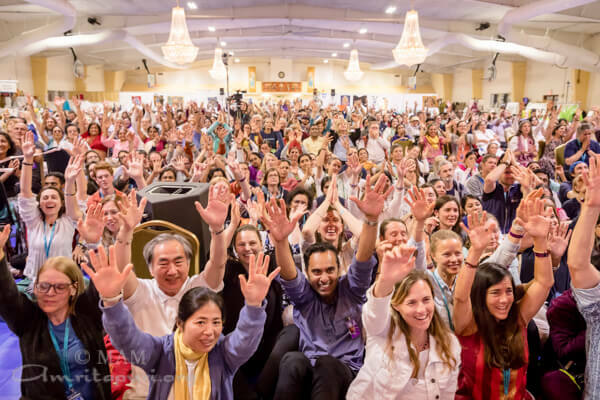 Thank you.” It was Mr. Panda’s first public engagement in his role as Consul General of San Francisco. 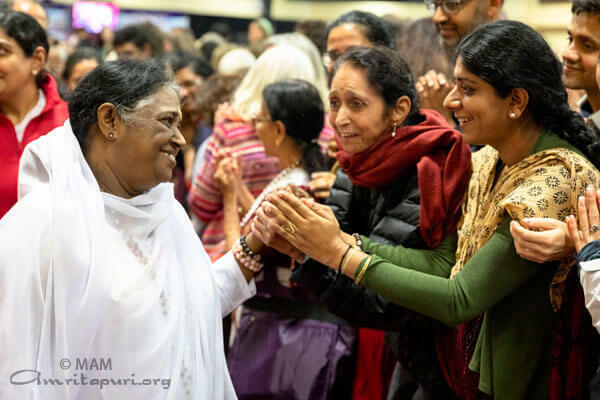 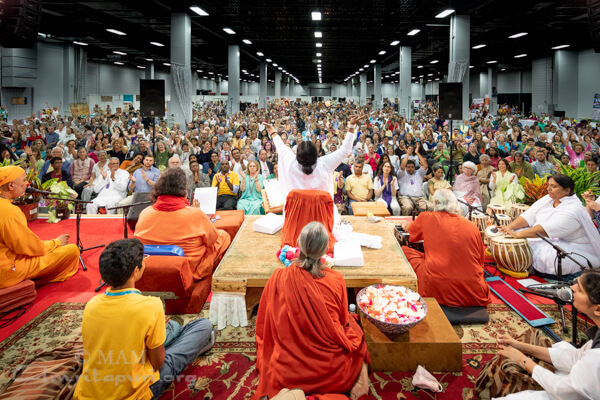 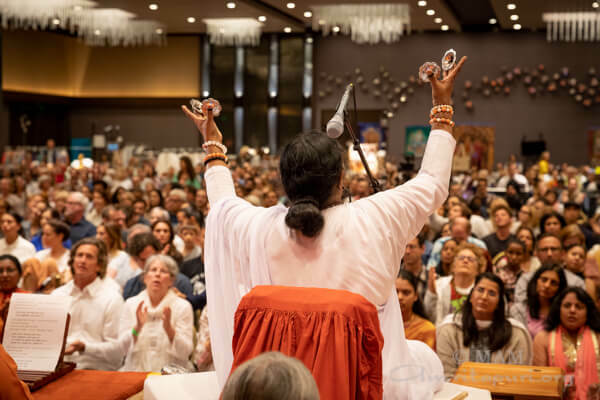 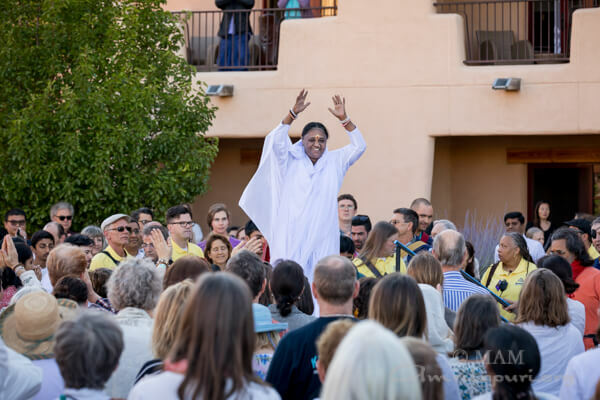 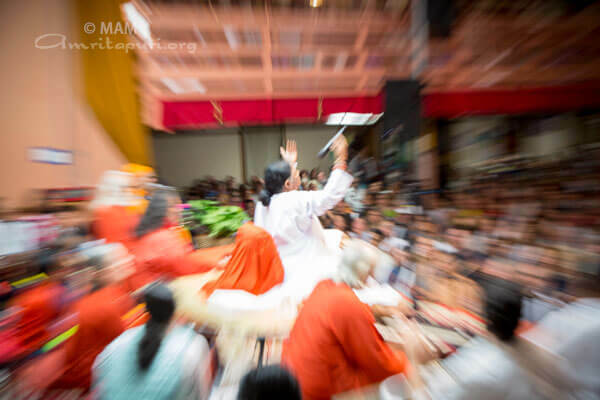 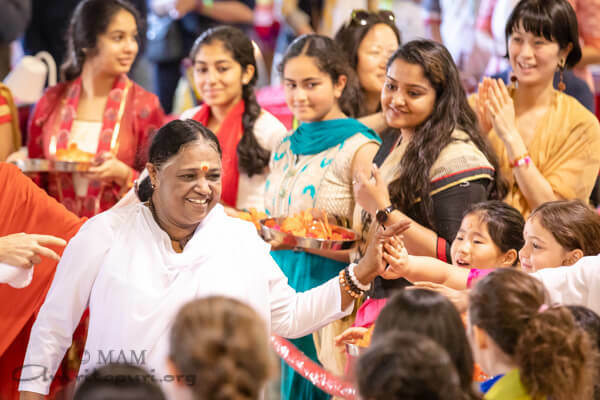 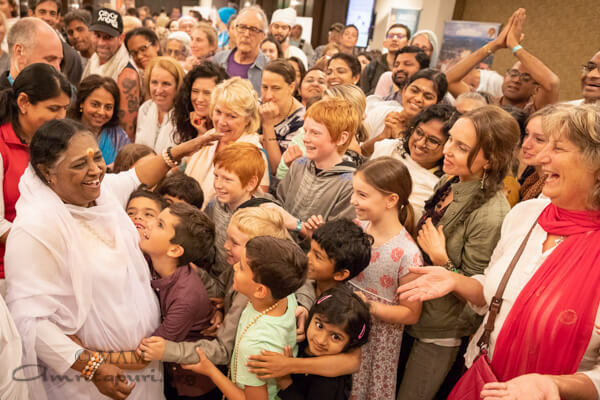 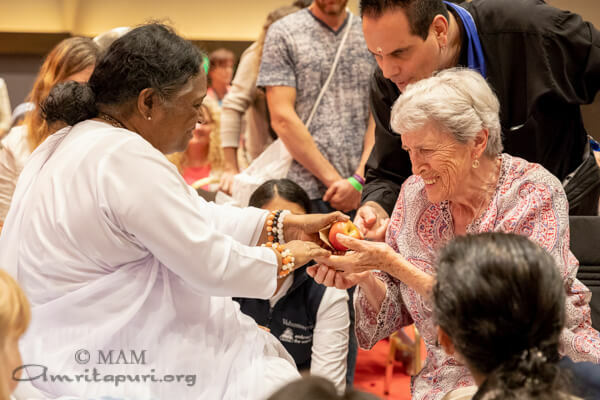 On the second morning, while waiting for Amma’s arrival in the hall, a choral group led the gathered crowd in an a cappella chant ‘Amma, Amma, Amma.’ First rising in volume and speed, the chant then softened into a whisper as Amma entered the hall. 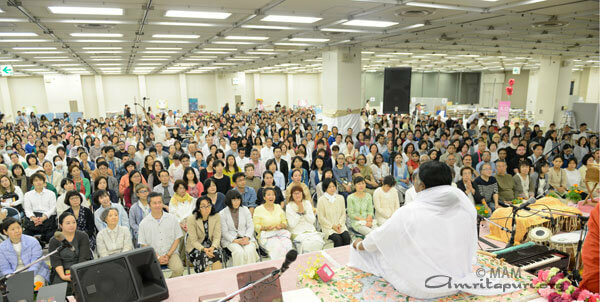 The retreat was held from Nov. 24th to Nov. 26th. 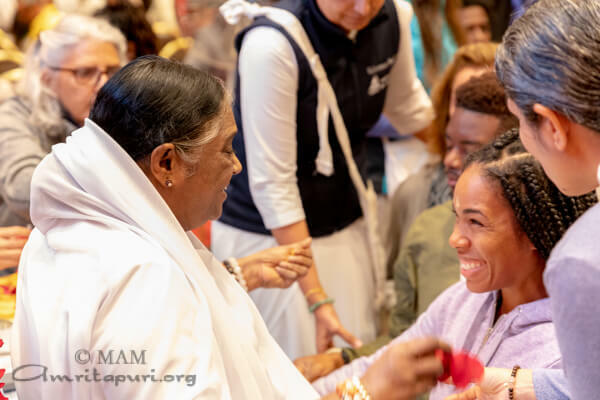 In addition to Amma’s Darshan, Satsang, and Bhajans, there were pujas, early morning meditations and IAM Integrated Amrita Meditation classes. 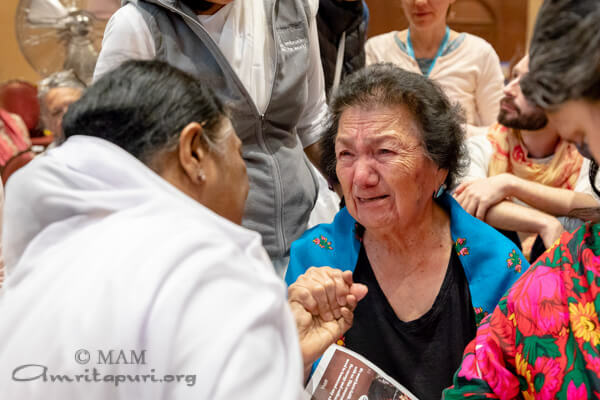 On the second evening of the retreat, Amma led everyone in meditation, held a question and answer session, and served everyone dinner. 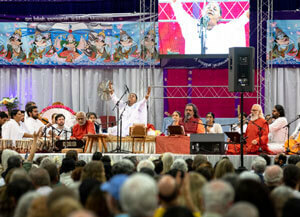 That evening later featured a number of cultural performances by devotees from around the region. 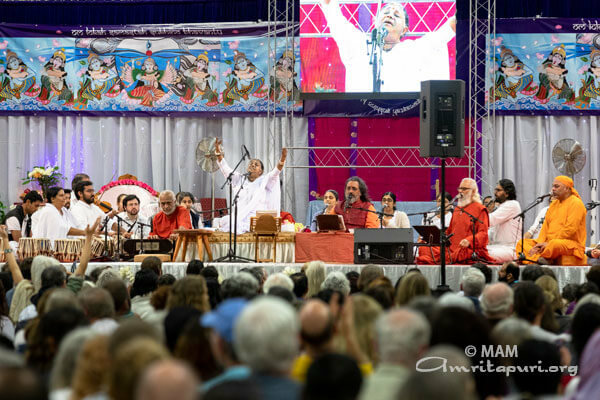 First, a group featuring a guitarist, flutist, tabla player, violin, and keyboard players entertained the crowd with a jazz and bluegrass fusion performance. 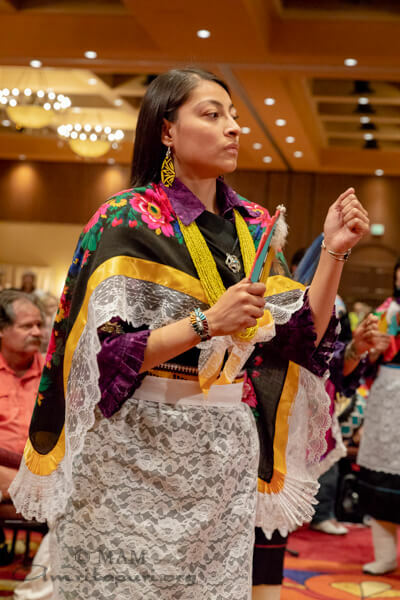 They were followed by a woman who performed a traditional Hawaiian dance which included chants to the Laka – the goddess of Hula. 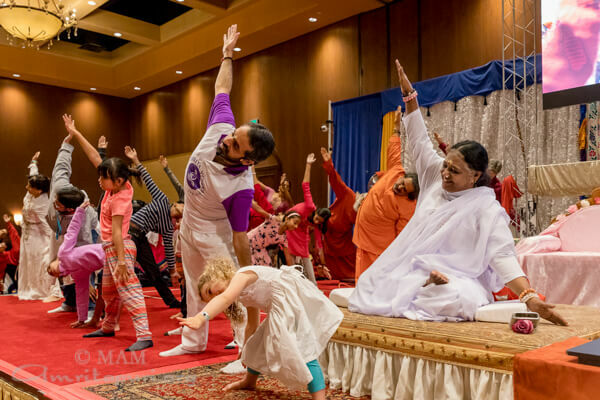 The cultural performances concluded with a dance by local devotees to ‘Bomma Bomma’ – a traditional Ganesh bhajan. 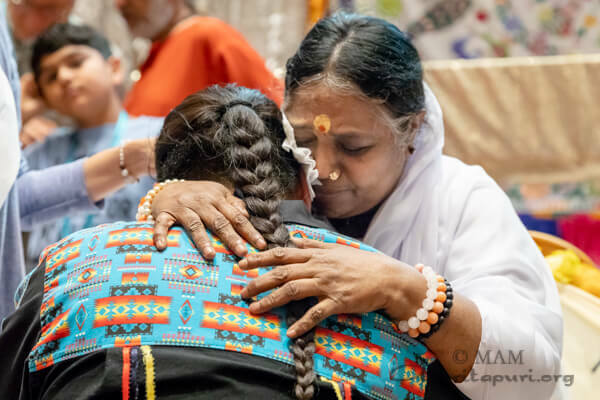 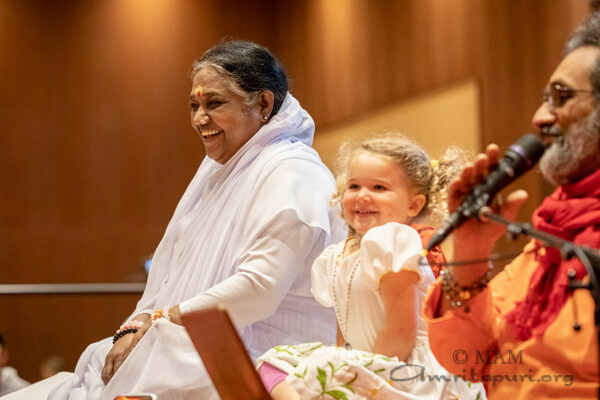 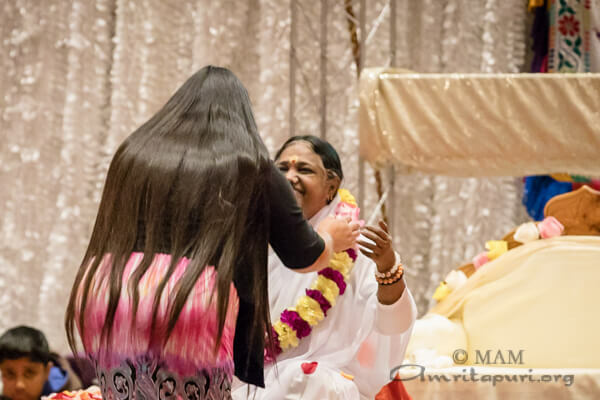 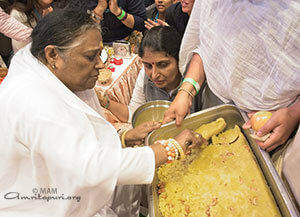 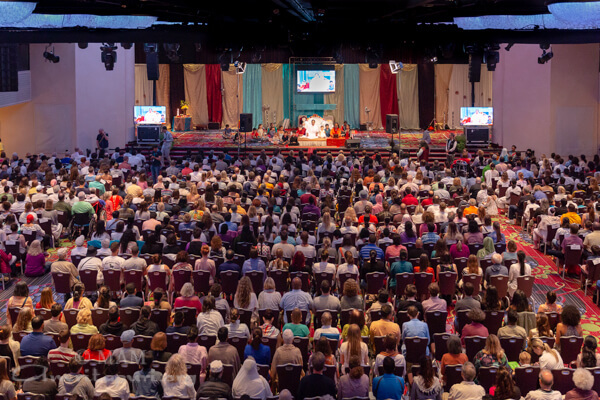 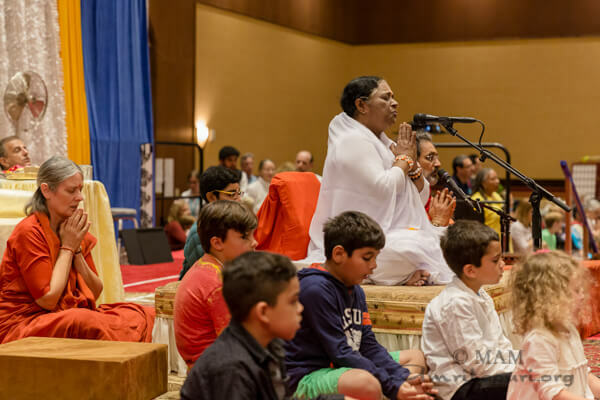 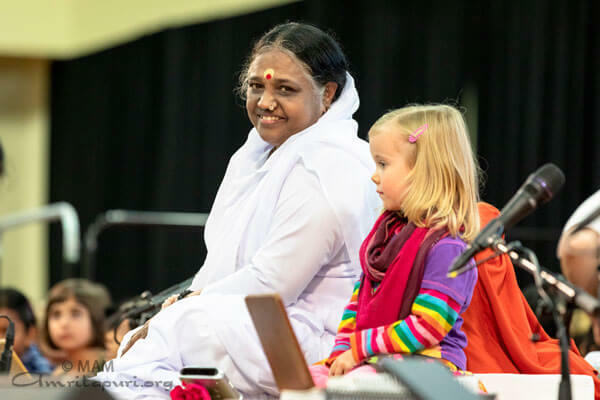 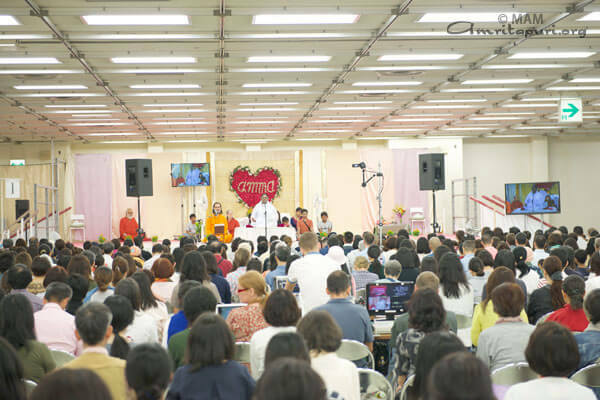 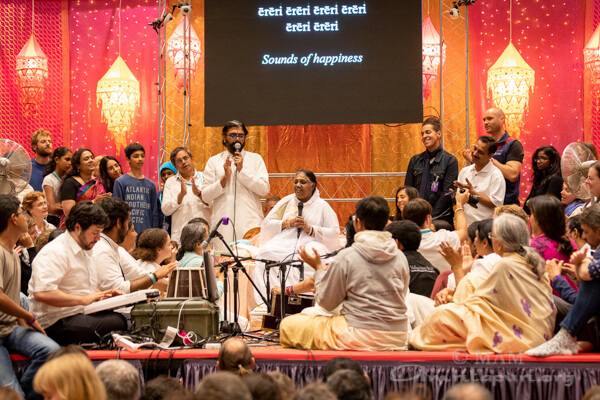 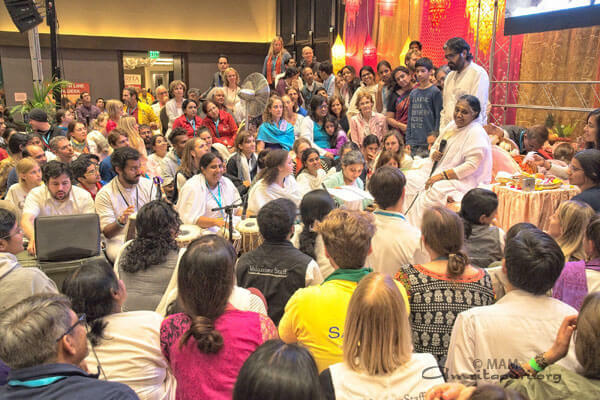 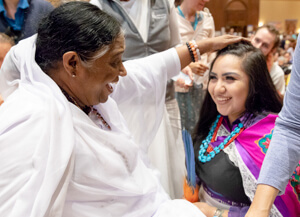 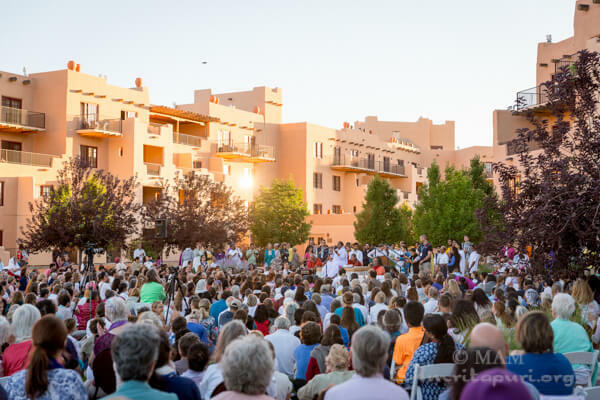 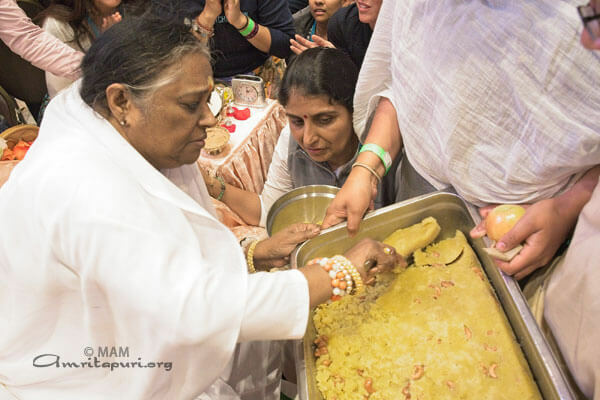 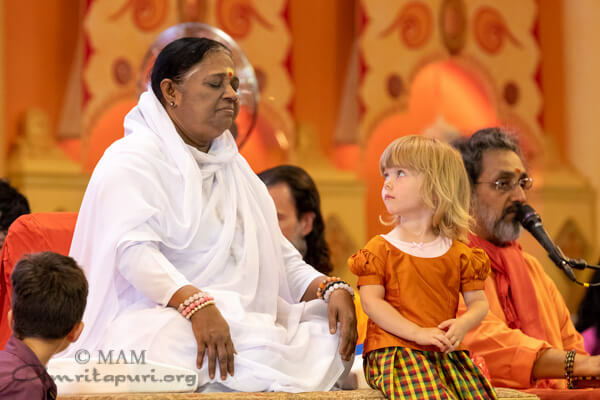 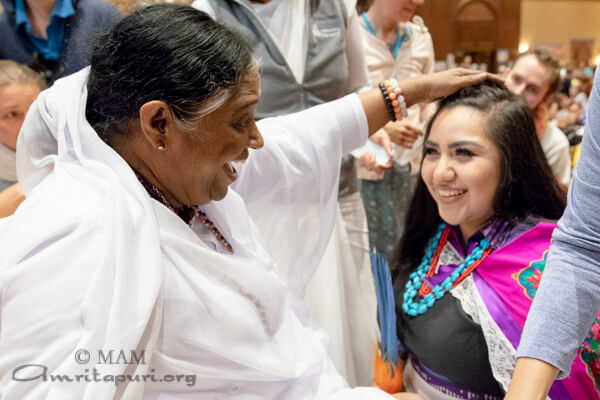 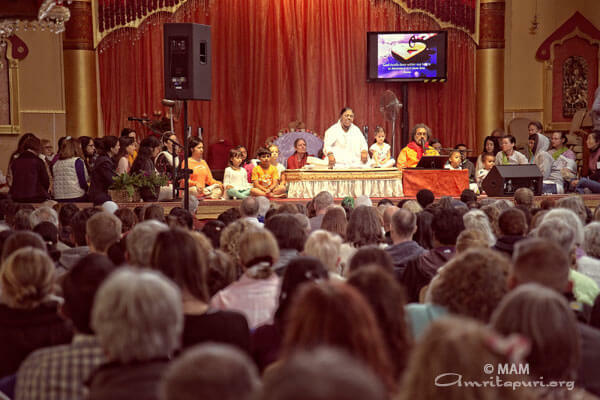 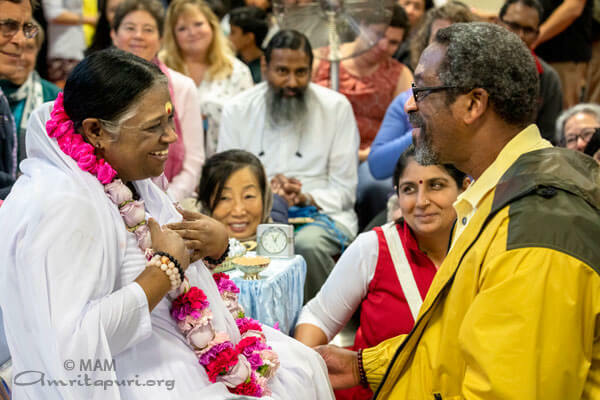 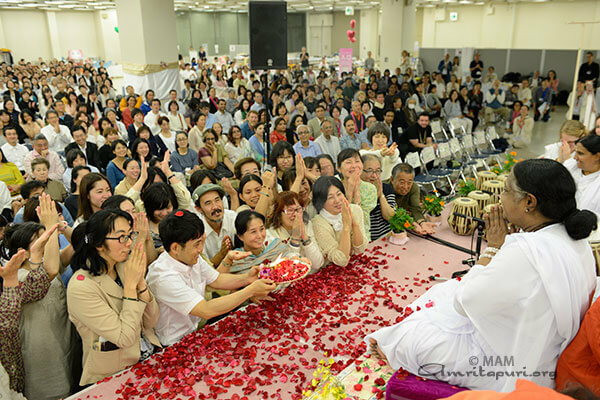 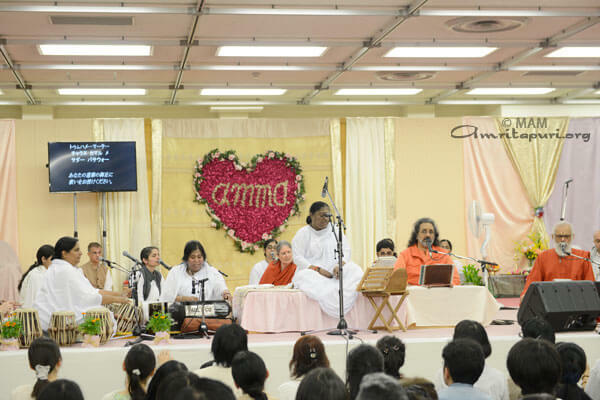 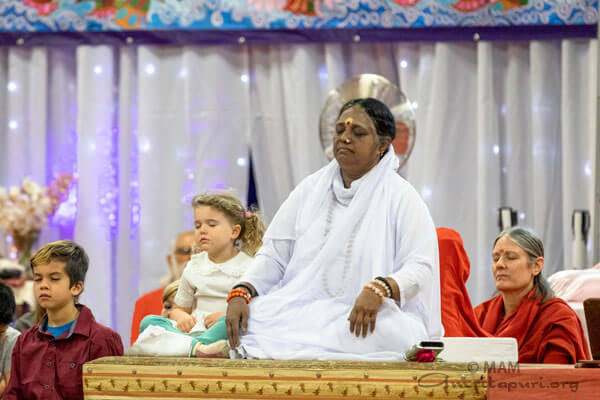 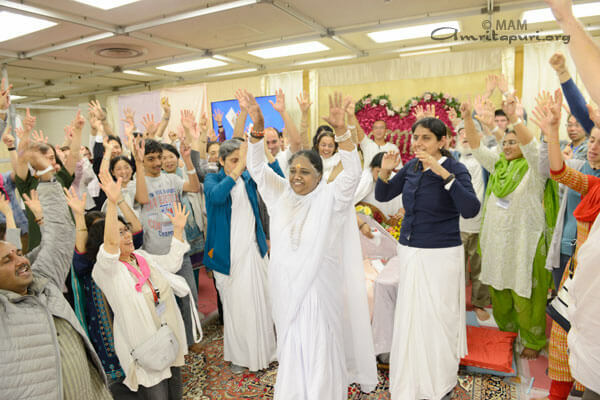 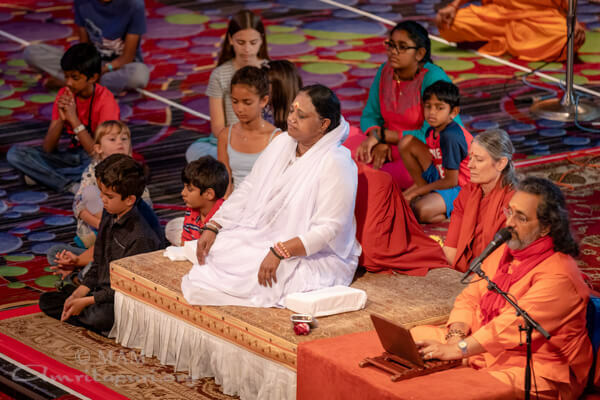 During Amma’s Satsang, Amma shared some divine wisdom about respecting Mother Nature and one another. 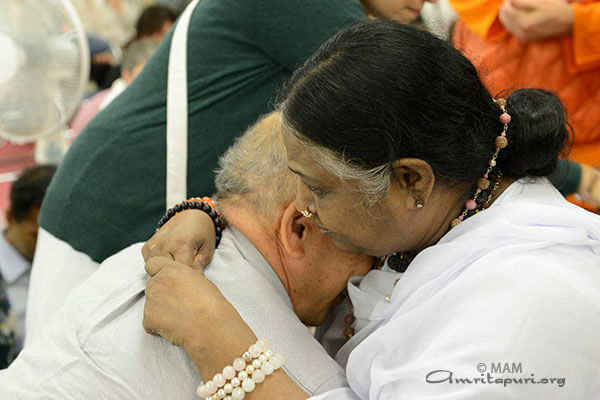 Amma said, “In truth, the spiritual path both begins and ends with compassion. 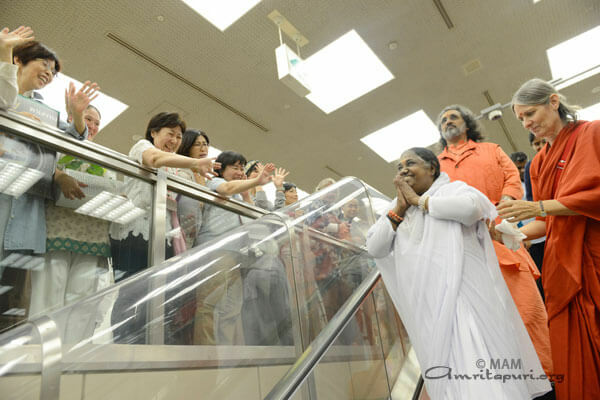 Let us try to awaken positive emotions within ourselves and contribute positive vibrations to the world.